Intel’s Centrino brand has developed extremely well since its introduction less than two years ago. You could go as far as to say that Centrino has been Intel’s quickest zero-to-success brand that we’ve ever seen in the history of the company. A very large part of the success is due to the strong technology behind Centrino. AMD doesn’t have the resources of Intel, that’s plain and simple. They have done an excellent job with their K8 architecture, but for AMD to devote additional resources to developing another architecture, strictly mobile oriented, it’s just not possible at this time. At the same time, AMD’s Athlon 64 is far more suited for mobile environments than Intel’s Pentium 4 ever was, so the need for a mobile specific architecture isn’t as great for AMD as it was for Intel. So when AMD announced their Turion 64 “Mobile Technology” we had a feeling it would be something very similar to their desktop Athlon 64s, today AMD confirmed that. Much like Intel’s Centrino, AMD is referring to their Turion 64 as a “Mobile Technology” and not just a microprocessor platform. AMD has seen the success of Intel’s Centrino Mobile Technology and is hoping to capitalize on some of that success. Unlike Centrino however, Turion 64 doesn’t rely on AMD-supplied chips to receive the branding. AMD will provide the Turion 64 processors, but chipsets can be provided by a number of vendors as can the LAN and wireless controllers. AMD is far less restricting on the components that make up Turion 64 enabled notebooks, which means that they will inevitably be cheaper than Centrino platforms, but it also means that they may not be as power efficient as Centrino platforms - it’s a tradeoff that AMD honestly had to make, as they are far from being in Intel’s position. The Turion 64 processor is basically a 90nm mobile Athlon 64, so all of the architectural features of the Athlon 64 make their way to the Turion 64. One advantage that the Turion 64 has is that with an on-die memory controller, AMD can potentially offer lower memory controller power consumption than Intel. The Turion 64 is based on the latest revision E4 of the K8 core, meaning that it supports SSE3 instructions as well as lower power states. The Turion 64 line also supports AMD’s PowerNow technology (known as Cool’N’Quiet on the desktop), which allows for clock speed (and voltage) modulation between 1.0GHz and the processor’s maximum frequency based on load. The Turion 64 will be available in both 1MB L2 and 512KB L2 cache models, but both models will only support a 64-bit (single channel) DDR400 memory controller. The first Turion 64s will be available in speeds ranging from 1.6GHz up to 2.0GHz. As the chart above shows, currently AMD has two Turion lines - a 35W TDP and a 25W TDP line (note that Intel’s Pentium M 755 has a 22W TDP but they are measured differently from AMD). The second letter in the model number indicates the level of power consumption of the processor, with “higher” letters denoting lower power consumption (e.g. MT-34 has lower power consumption than the ML-34). AMD is clearly doing a bit of chip binning, with chips capable of running at lower voltages (and thus lower power) being set aside for the Turion 64 line. This isn’t much of a surprise as they do a similar thing on the server side to create their low power Opteron HE and EE chips (50W and 30W respectively). The two digits, as usual, indicate clock speed/cache size and other performance impacting features. The Turion 64 ML series is obviously a 90nm Mobile A64 (both are 35W, both are S754, etc., etc.) However, the MT series is a 90nm 25W Mobile A64. There is a difference, just not a big one. I've been waiting for these forever - I'm so excited they're finally here but I'm dissapointed in the lackluster vendor support. Questar - "Did you forget about the ultra low voltage Pentium M that's only 5.5 watts?" 2. The data showing that TDP for Intel and AMD are based on different things (meaning that an Intel TDP of 27w is probably about equal to an AMD TDP of 35w because Intel uses probable power and AMD uses max theoretical power). "No chipsets from AMD either"
Both Via and ATI have announced and shipped their chipsets already...Via's is the K8N800A, and ATI's is the mobile version of the Radeon Xpress 200. Personally I'll be interested in these chips in laptops because I do a lot of the sort of stuff (floating point...) that I know the A64 architecture is so good at. I suppose if I were a digital video buff I might prefer the P-M.
#30, nice, bring the picture comments over here. I will be the first to say, Why did you use JPG? They are so HUGE! LMAO JK. 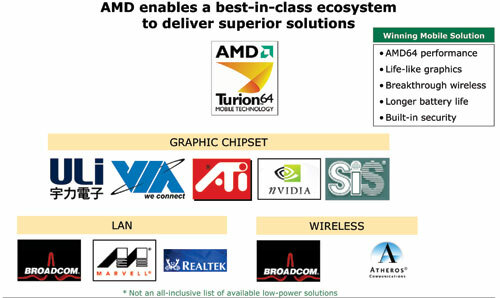 IMO, I know that AMD doesnt have the luxury of controlling what it will brand with the mobile 64 for the Turion platform but that integration is what made the Centrino partly in its success. One thing i can think of is the software issues. There isnt multiple platforms or chips to worry about, just one set of 3 components dictated by Intel to a certain standard.